Gruppo Campari's Wild Turkey® Bourbon is looking for the best whiskey bartender in the UK. The iconic American brand, made famous by the legendary Wild Turkey 101 Bourbon, announces the launch of the inaugural “UK Wild Turkey Cocktail Competition” to take place in August of this year. The announcement follows the brand's multiple award wins at the 2013 International Spirits Challenge and appointment of Martin Taylor as Wild Turkey’s first UK Brand Ambassador. The initial UK Wild Turkey Cocktail Competition invites bartenders from across the country to compete for the title of UK Wild Turkey Champion 2013. Eddie Russell, Associate Master Distiller for Wild Turkey and Kentucky Bourbon Hall of Fame member, launches the inaugural competition with a visit to the UK this month. During Eddie's visit he will host a series of master classes across the country where bartenders are promised an intimate insight into the making of the award-winning brand. On Monday 22nd July, Eddie will host the first master class Bourbon session in Edinburgh (Voodoo Rooms) at 11am; followed by sessions on Tuesday 23rd July Manchester (Room) at 12pm and Nottingham (Boiler Maker) at 5pm; Wednesday 24th July Birmingham (Victoria) at 12.30pm; Thursday 25th July Bristol (Milk Thistle ) at 12pm, and Friday 26th July London (The Blues Kitchen) at 12pm. Speaking about the announcement of the UK Wild Turkey Cocktail Competition, Russell said: "In the US, Bourbon is experiencing massive growth thanks to bartenders rediscovering all the classic cocktails: Manhattans, Whiskey Sours, and Old Fashioneds. Those famous drinks, and the contemporary versions we are seeing lately, really showcase the great natural flavours in Bourbon. I am excited to talk to UK bartenders about the natural process of making Bourbon and how Wild Turkey is different to other whiskies. We use only the best grains and barrels with the highest char. Plus we distil at a very low proof to maintain the deep, rich flavour. All this leads to the most robust, flavourful Bourbon in the industry." The first round of the competition kicks off in August. Mystery shoppers (drinkers) will be inspecting the work of entrants to win their place into the regional heats. Ten of the best cocktail makers in each city (Edinburgh, Manchester, Nottingham, Bristol, and London) will go head to head, with the top two bartenders in each heat winning a place in the national final, to be held at The Liquorists in Manchester on 2nd September. Judges including Simon Difford of diffordsguide, Martin Taylor of Wild Turkey, and Hugo Mills of Gruppo Campari will be on the search for a bartender with passion and an understanding of authentic Kentucky Bourbon Whiskey in a showcase of craftsmanship, balance and taste. The winning bartender plus two runners up will each win a trip to the Wild Turkey distillery in Kentucky during the annual bourbon festival. Christophe Schaillee, Regional Director Europe at Campari International, said, “It is a wonderful opportunity to have Eddie Russell launching the first ever UK Wild Turkey Cocktail competition and at the same time host the master Bourbon classes. Wild Turkey is very respected by bartenders and is becoming very fashionable with consumers, and this is a great occasion for audiences to know and appreciate the brand even more. 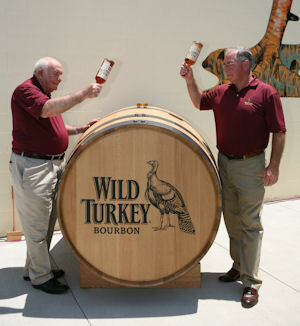 We are very proud of our product and these events are the best way to show the uniqueness and versatility of Wild Turkey." For full terms and conditions and information on entering the competition visit http://www.wildturkeycocktailcomp.co.uk/ entries close 31 July 2013.